An impressive display by Cov from start to finish, as Moseley are put to the sword. Well, I thought we might pinch it, but I didn't see that coming. Cov looked good today; strong in the scrum, dominant in the lineout, and very sharp in the backs. This was a real marker for the season, and if we keep this up I reckon we'll be right in the mix for promotion when spring rolls around. It's unfair to single anyone out, but both Stokes tries were things of beauty, and that rolling maul/sprint is certainly going to frighten a lot of teams. Final score: Coventry 50 - 11 Moseley. There are one or two unexpected ones there. 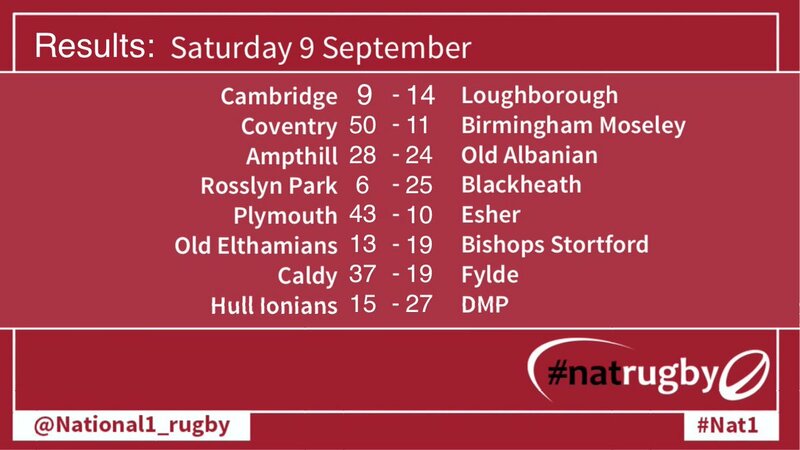 Didn't see the RP result coming, and Ampthill? By four? Hmmm. Thought Cambridge might do better. Context given to last week's Hull result by the much closer DMP one this week too. Just to add, a big thumbs-up for the programme this week, which I managed to get home without it looking like the dog had got at it. Lesson learned I hope? I'll overlook the teething troubles with a few areas of it (except maybe to say that I was shocked to learn that Old Albanians no longer seem to be in the league...). Oh, and don't forget Ben Palmer's try Russ. Sublime. Totally agree regarding Palmer's try, Kimbo. Clearly another player with a ton of flair. In fact it seems hardly fair to mention any individuals really because everyone in the squad played their part today, I thought. And I don't believe Moseley are a poor side, but we gave them a bit of a pasting today. Fair play to Rowland Winter, he's recruited some terrific players, and more importantly seems to be making a team that is at least the sum of its parts. I don't mean that as faint praise,indeed the opposite. I think as we've seen in the past getting that right is a very hard thing to do. Early days yet, but I'm very excited about this season! I believe Ampthill were 14 points down after 10 minutes and 14-7 at half time. Not sure if it's worth doing highlights - two penalties and a try at the end - hardly worth it. What do you lot think? Only doubt from the game was the official attendance given as 2,100. It certainly looked quite full in the main stand,opposite and at the railway end. For the first time at the BPA , i had that special tingle down my spine, just as the team ran onto the pitch and the crowd greeted their team. For the first time in many years , i saw a COVENTRY team play as ONE, but with the skills of individuals. "They were better bigger less error ridden less infringement culprits better tackling faster"
Where will we finish at the end of the 2018-19 season?